And NAHB expects this growth for home building to continue. For the single-family market, there were 535,500 total starts for 2012, a 24% increase over 2011. The current rate of single-family construction is now up 74% from the market low point of March 2009 but represents only 44% of ‘normal’ conditions (levels of activity comparable to the period of 2000 through 2003). For 2013, we forecast that single-family starts will total 650,000, a growth rate of 22%. 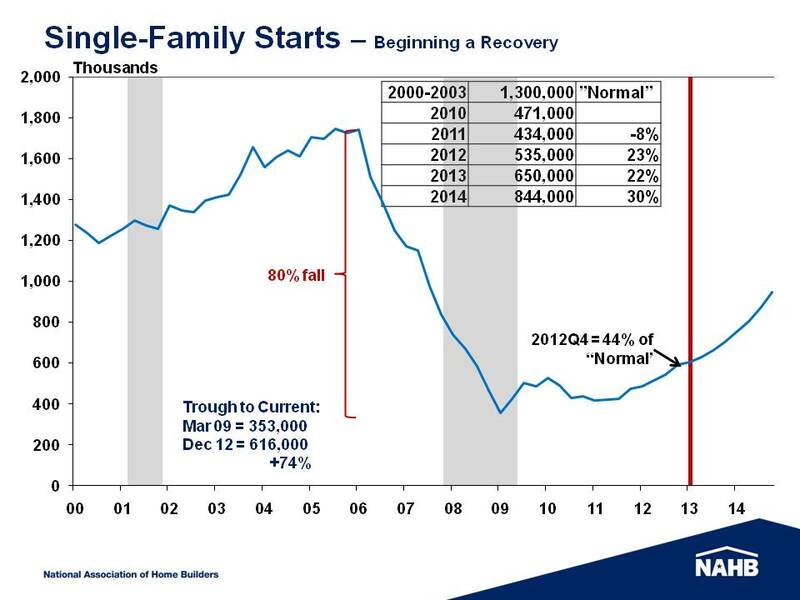 And we expect that growth to accelerate into 2014, when single-family construction will grow another 30%. Lending activity continues to improve, albeit at a moderate pace. The Beige Book indicated that tightness in mortgage lending may be showing signs of recovering in certain regions of the country. Overall, loan demand was higher or held steady in nine of the ten districts. Credit standards remained ‘largely unchanged,’ though two districts, Atlanta and Chicago, reported that standards may have ‘loosened some.’ In the Atlanta District, aggressive competition for highly qualified borrowers was leading a growing willingness on the part of banks to increase their risk tolerance and loosen credit standards.